Back when Loretta Lynch was being considered for Attorney General, I told you that she was a justice-in-waiting. Nevertheless, "establishment" senators moved heaven and earth to accomplish her apotheosis. Now, she is at the top of the New York Times' "REPUBLICANS PAY A PRICE" list of potential court nominees. And the only reason she isn't a "done deal" is that we garnered so many votes against her earlier nomination. Now, with the death of Antonin Scalia, even Senate Republicans seem to understand that the stakes are apocalyptic. And a surprising number of them are trying to do the right thing. First: Once the nomination is referred to the Judiciary Committee for hearings, Harry Reid has an absolute right to bring the matter to the Senate floor—and there is nothing Mitch McConnell can do about it. Once the nomination is in committee, it is in order for Harry Reid to make a motion to discharge the nomination, so long as the Senate is in executive session. Reid will reduce his motion to writing and bring it "over under the rule" onto the executive calendar. At that point, any senator can move the discharge motion, so long as the Senate is in executive session. And it is possible that Reid will try to discharge by 50 votes (plus Biden) by combining the effort to move the discharge motion with the non-debatable motion to proceed to executive session. If the motion to discharge is adopted, it would subsequently be in order, with 50 votes (plus Biden) to move to proceed to the nomination, as in executive session. Normally, cloture on the nomination would take 60 votes. But if Reid tries to destroy the Senate rules by "nuking the nomination," it's possible this could be done with 50 votes. (More about this later.) And, of course, the confirmation vote itself would pass by a 50-vote majority. Now, there are a couple of "chokepoints" in this process. Even Republicans who are squishy on the "she deserves a vote" issue may balk at discharging the nomination right out of Chuck Grassley's hands -- in violation of Mitch McConnell's wishes. And they may also balk at "nuking" the cloture vote. But make no mistake about it: The withering pressure that has already caused Thom Tillis, Chuck Grassley, and Orrin Hatch to wet their pants and flee is only going to get more intense as the prospects of victory become more imminent. Second: Conservatives had better hope and pray that the “nuclear option” is not expanded. House conservatives have made a campaign of trying to destroy the Senate rules so that their go-nowhere bills will die by veto, rather than filibuster. These conservatives may want to hope that no one is paying any attention to them. As we have seen, Harry Reid has an absolute right to force the Supreme Court nomination onto the Senate floor. And there may be only one point at which the process could be filibustered. I know, I know. The November 2013 precedent supposedly exempts Supreme Court nominations. But understand this: The "nuclear option" is nothing more than a process whereby 50 senators (plus Biden) can do whatever the heck they want, whenever the heck they want to do it. If 50 senators (plus Biden) vote to appeal the ruling of the chair that cloture requires 60 votes, then cloture ceases to exist for the purpose of that vote. Given that people like Orrin Hatch have already flaked -- and people like Mark Kirk are expected to do so -- conservatives had better hope and pray that that sixty-vote threshold holds. Third: If Republicans Fight, the issue will break, politically, in their direction. If Obama's nominee prevails, there is no doubt that the court will, by a 5-4 vote, reverse the pro-gun holdings in Holder and McDonald. Thus, in the courts' view, the Second Amendment will no longer be an individual right. And the Second Amendment will no longer apply to the states. The Second Amendment will, effectively, be ripped out of the Constitution. It is significant that Barack Obama didn't become overtly anti-gun until the day after the 2012 elections -- when he moved to reactivate the anti-gun UN Arms Trade Treaty. And, even after Newtown, Democrats were careful to argue that their gun control proposals were nothing but "reasonable, commonsense tweaks" -- even though the Second Amendment community knew this was a lie. So here are the states which will be central to control of the Senate and control of the White House in 2017: Nevada, New Mexico, Colorado, Florida (with the "swing vote" in the redneck panhandle), North Carolina, Virginia, New Hampshire, Ohio, Iowa, Pennsylvania (whose coal industry is also up before the court), Minnesota, Michigan, and Illinois. With the possible exception of Illinois, there is not a single one of these states where a call for repeal of the Second Amendment is not a political death sentence. As Democrats found out in 1994, 2000, 2010, and 2014, "gun control" is the real "Third Rail" of American politics. And Democrats are about to embrace gun control in a way more foolishly sweeping than they have ever done before. Fourth: Forget historical precedent; the issue is an unprecedented question of whether a lawless president should be allowed to appoint a puppet justice to rubber-stamp his lawless and unconstitutional actions. Make no mistake about it: The "judicial" folks of both parties are hypocrites and scumbags. In 2005-7, it was the Republicans who were talking about the fake "duty" to accept or reject a nomination -- and who were trying to blow up the Senate rules to pack the courts. And it was Schumer who was willing to let a Supreme Court vacancy fester for years, in the interest of shaping the court to his ideology. It became clear, when we were vote-counting NFIB v. Sebelius, the Kagan and Sotomayor have turned into puppets who predictably implement Obama's will. They may bolt on insignificant issues, but, with respect to things liberals care about, the sum-total of their "jurisprudence" can be reduced to two words: "Yes, master." 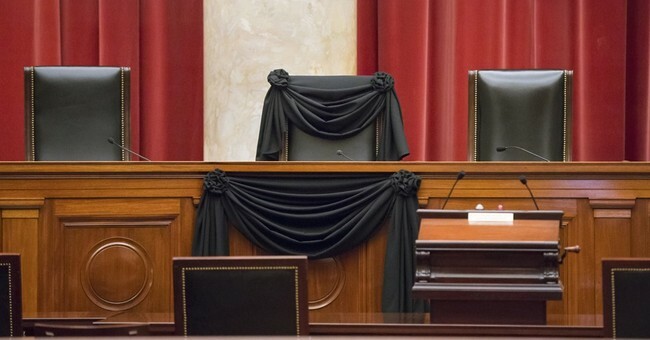 In fact, you could leave Scalia's chair empty, and that chair would be less predictable than Kagan and Sotomayor. Combined with Obama's propensity to ignore the law and the Constitution in order to accomplish his "transformational" goals, the effect of confirming a puppet would be to create a lawless court to rubber-stamp Obama's lawless actions. There is no historical precedent for this. Fifth: Obama’s strategy is to put a “human face” on the nominee and then pick off squishy Republicans one-by-one. The benefit of watching MSNBC and reading the New York Times is that Obamaistas have restated their strategy over and over and over and over again. The "human face" process will begin with the nomination. But if Grassley holds hearings -- and committee members are forced to meet with the nominee in anticipation of hearings -- the process will advance. When the nominee answers questions before the committee -- flanked by his or her photogenic family -- the process will accelerate. And you can bet the nominee will have a narrative in which he or she professes a "history of hunting" and a love for the Second Amendment and for stare decisis. All of this will be reinforced by public pressure that will make the gun control effort look like a walk in the park. As with Toomey-Manchin, senators somehow think that, if they give into the "they deserve a vote" rhetoric, the pressure will somehow be ameliorated. But, in fact, the pressure only becomes more intense. Because, when Obama says "They deserve a vote. ", what he really means is "They deserve a "yes" vote."